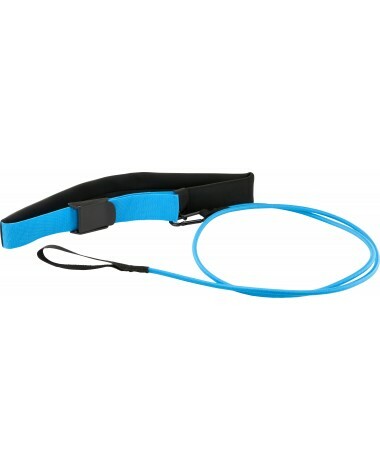 Boost your water workout with the Aquatic Resistance Belt! The LAQRES is a comfortable, stationary swim training device that builds strength and endurance. With quick drying capabilities, it offers optimum comfort and convenience. The adjustable belt and clip system on this aquatic fitness equipment accommodates various body types and makes for a secure, perfect fit every time. 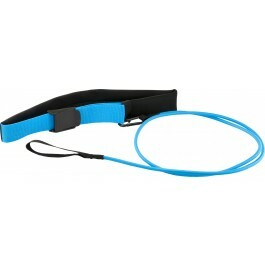 Sporting a black and blue color combo, this aquatic belt has a fresh, attractive look. This is an excellent product. Its durable and simple to set up. It provides excellent resistance training and has many other possible uses. I bought it a year ago through amazon, and compared it to other cords, but this one is really the best one for swimming. It is very high quality belt, the waist is comfortable, and the elastic is strong, and linear and after almost daily use, it still looks like when i bought it new. I have other belts as well, but the quality is less, you can see quickly the wear, and the elastic looses it elasticity. The elasticity of other belts is weaker than the one from TYR, which is important, because when you want to swim faster, you do not get moved out of place that much, which could be a real pain. If you like swimming, i strongly recommend buying this belt. Your swimming stroke is changed a bit with the belt, but helps those with short pools do "laps". The tension can be used for sprint training where you really try and stretch it out. A: The Tyr Aquatic Resistance Belt can be attached to a pole by looping around and fastening the cord with the provided caribiner. The belt can be used in a lap pool or a smaller pool. Q: I want to use this when I travel and only have access to a small pool. What do I fasten it to? Do I need tom"wing it" and find something when I am on site? Our Aquatic Resistance Belt product uses a metal buckle that links to webbing on the belt. the metal buckle connects to a carabiner that links to the bungee cord. We do not supply the pole you hook the belt on. Q: What is the resistance strength of the chord? A: As the range of motion of the exercise increases, the resistance provided by the elastic equipment increases. As its length increases (from being stretched), it provides more resistance. One of the benefits of this is that as the range of motion increases and the resistance increases, the number of muscle fibers that are being used in the exercising muscle increase. Q: Do you ship to Australia?